your sidebar real estate considerably by displaying only Pages of current interest. 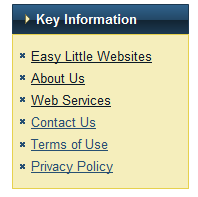 you designate which Pages should be excluded entirely from the list. I once used a rather complex function called Fold Page List by the same author as Folding Category List. It took a long path to do the same thing as wp_list_pages(). And it didn’t upgrade well. Here it’s redone with entirely new logic that makes it fast and clean, plus there’s a powerful widget with lots of customization options. And it’s compatible with sorting functions like pageMash. 1. This is the display of the widget on the Front Page. Top level Pages only are shown, excluding any that were checked in the widget options. 2. This is the display of the widget when you select the "Contact Us" Page. 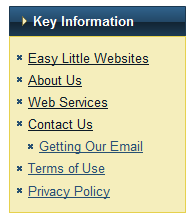 The top level categories are still displayed, plus the children of "Contact Us," in this case "Getting Our Email." Children of other top level Pages do not appear. 3. This is the widget drop down options panel, illustrating how you may choose to exclude listed Pages. Download and unzip ryo_folding_page_list.zip. This will unzip to a folder called ryo_folding_page_list. Upload the ryo_folding_page_list folder to the /wp-content/plugins/ directory. This would allow you to have a completely separate block in your sidebar for unrelated or special Pages. Folding Page Widget #1: Exclude Pages D, E, F.
Folding Page Widget #2: Include only D, E.
Folding Page Widget #1: Include only F.
which you want to appear in Widget #2, you'd have to add it to Widget #2 and Exclude it from Widget #1. When I select a subpage, will other subpages on the same level be hidden? be hidden. This means one has to go to the parent in order to choose a subpage. How do I use this without the widget? You call ryofpl_folding_list_pages() using the same arguments you would for wp_list_pages(). this is an elegant solution to an ongoing problem in wordpress. the plugin works flawlessly. though ther is one little kink. when i select a subpage, all subpages on the same level get hidden. meaning one has to go to the parent and choose a subpage. that’s not allways very handy. Raphael, Good idea. Try this one out (.03). How to use plugin without widget? current parent page. This was the request Raphael made earlier. Is there something more I can help you with? I have 3 pages that have many sub pages. This sub pages also have sub pages. I want to have 3 sidebar menus, for each kind of page. It shows me all pages. My question – how to make folding list pages only for one page? The way the widget does it is to exclude pages you don’t want to see by building an exclude list. You check off pages to include, and others are excluded. OR you check off pages to exclude, and those are passed in the exclude list. You might try it in a widget and look at the code the widget generates, grab the code from there. Then you could pull the widget. I have a client who has upgraded to beta and has problems. Where is the download for the initial stable release please? Paul, this has not moved out of beta yet. What problems is your client experiencing? With which version of WordPress? I need the list of sub pages to still be listed when a user goes to the sub sub page, I tried loading another instance of the widget that includes all pages, but it still hides all of the pages when you are in the 3rd level page, is there a way around this? Just what I’m looking for except it’s not displaying subpages in the menu when on those subpages, is it compatible with wordpress 3? Yes, it’s compatible with WP3. It should show the subpage you are on at the time, and subpages under that page. It won’t show all the other subpages; that’s the point of using this… to shorten your page list. Shortening the page lists is exactly what I’m after. The subpages all appear within the widget area under each parent page, but not on the actual page. The menu on the left is standard vertical nav which shows subpages under top 3 parent pages. Well, Oliver… you’ve provided a good example of the problem, and you’re having one. My only guess is that another plugin (or, maybe, your theme) is blocking those subpages. This plugin works by detecting the pages that should not appear and adding them to the exclude list. It doesn’t put them into the include list. That makes it possible to have other plugins exclude pages, as in a membership site when a page should appear only if a qualified member is logged in. The membership software can exclude pages, too. So you might have something else excluding those pages from display in a way that doesn’t affect the other nav widget. I guess it must be the theme as its the only plugin active. I used the starkers theme and plugged in some basic html/css, so along the way something I’ve done has affected your plugin. Frustrating as it seems the best (if not only) solutuion to this kind of page nav within wordpress. Thanks for your help anyway, I shall persevere! Oliver, if you figure something out, let me know what might be affecting it! When using multiple instances of the widget on a site is it possible to style each one differently? If so how would I target each one? Thanks for any advice you can give…. This would give you styling capabilities. Hi Rich, I managed to figure it out thanks for your help. One last thing though! I think not with the current code. You could, of course, modify it. Thanks for quick reply Rich, guess I’d better learn PHP! dont suppose its a case of adding a quick line of code to “// Show immediate children & siblings” section in the code? This makes it impossible to navigate directly from say, Sub-page 3.3 to Page 4 (or any other top-level page besides Page 3), forcing the user to click back up the nav tree to once again reveal the navigation to the other top-level pages. What would be great is if you could include a “show all top-level pages” checkbox, so that they wouldn’t disappear when a grandchild page is clicked. I have spent many hours trying to code this or looking for plugins, and the closest I’ve been able to get is your plugin. Thanks. YOU ARE BRILLIANT. I have trying to find a solution like this for hours now. Kept trying Fold Page List, but I have a sneaky suspicion that is not working in the latest version of WP. I installed your plugin and voila, works effortlessly and does EXACTLY what I need it to do. However, I thought that I’d describe what I need and what would IMO be the grand page list widget – and maybe you’d like to implement these features yourself? There have already been comments about this, but once unfolded a list of subpages should not be unfolded when you unfold siblings of another higher level page from the list. Anyway, great work, even if not exactly what I need. Congratulations. Great plugin, serves its purpose. However I got 2 issues, hopefully you can help: I have many levels of pages, and I noticed that once I get into a page that is level 4 and lower, the menu stops showing the tree and shows the pages as if they are top level pages. How can I make the plugin show more than 3 levels as a tree? All the plugin function does is add pages to the exclude list, then calls wp_list_pages(). The widget is pretty standard as to style, so it’s more a matter of style in your theme. Now, if you’ve already excluded parent pages of a target page, that would break the hierarchy. But that has nothing to with the plugin. I guess you refered to that number of levels. When I set the widget, I excluded some pages, but they don’t belong to the the pages that I want to show. parent – sibling1 (2nd level) – sibling1.1 (3rd level) – sibling2.1 (4th level). When I click on sibling 2.1 pages of the same level, and of the one before it break from hierarchy, and list as parents of top level. My question is how can I “make” the plugin show more than 4 levels in hierarchy? Asaf, try the standard WordPress widget for Pages. See how those levels look there. It should be the same. So the issue is with WP and your theme. What the RYO Folding Page List plugin does is add to the exclude list, excluding pages with different parents. I used your advice and noticed that WP widget for pages shows up to 6th level in hierarchy, but the plugin doesn’t. 1. Can I change it so that the drop down list shows (gets unhidden) on hover instead of on click? Trevor, (1) You have the source code so you can change it any way you want, and (2) there’s no plans for jquery.